As fans wait patiently for something new from KING DIAMOND for the first time in more than a decade – and which could actually arrive some time this year, or perhaps not – at least this should keep them busy for awhile. 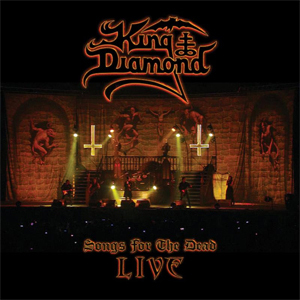 Songs For The Dead Live is a mammoth double-dose of Diamond's last headlining tour - during which the band performed the legendary 1987 album Abigail in its entirety – and features full, 18-song sets from the 2016 Graspop Metal Meeting in Belgium and a more intimate 2015 date at The Fillmore in Philadelphia. In all, it tallies up to nearly three hours of music and spectacle. Available in a variety of formats, it would make the most sense in this case to pony up for any of the packages that includes the video portion to see just what a spectacle it was. From its grand, gothic staging, elaborate lighting, costuming and theatrics that include “grandma” and her wheelchair and portray elements key to the Abigail storyline – and, of course, Diamond resplendent in his top hat and corpsepaint, toting his trademark leg-bone mic stand – it is arguably the most lavish tour the band had ever undertaken. Despite the contrast in the scale and atmosphere between the sprawling festival venue at Graspop and the cozier confines of the Fillmore, the band pulls out all the stops and gives both crowds an eyeful and, of course, earful capped by Diamond's signature growl and yowl vocals. The sets, though, are virtually identical – same 18 songs, with only “Eye of the Witch” and “Halloween” switching order. And along with all of Abigail, the band – longtime guitarists Andy LaRocque and Mike Wead and drummer Matt Thompson, and newish bassist Pontus Egberg – charge through such KING DIAMOND standards as “Welcome Home” and “Sleepless Nights” and a couple of MERCYFUL FATE classics, “Melissa” and “Come to the Sabbath”. The veteran band sounds equally tight and feisty during both sets, especially Wead and LaRocque who trade nimble, effortless solos throughout. Diamond proves he can still nail his piercing falsettos as a 60-year-old like he did back in the day, and shows no ill effects from the triple-bypass surgery that saved his life in 2010. And as frontman and ringmaster of the KING DIAMOND circus, he remains an affable and formidable showman, embracing both the sinister and cheesier aspects of the performance with equal gusto. Having only seen an abbreviated version of Diamond's current act during the ill-fated Rockstar Energy Drink Mayhem Festival in 2015, when the band was second on the bill to SLAYER, Songs For The Dead Live left me wishing I'd gone to see his headline show at The Fillmore here in D.C. nine months prior. Can't recall why I didn't go. My bad, though. Won't make that mistake again. But I did actually get to catch KING DIAMOND during the original Abigail tour way back in July 1987 at the long-gone Agora Ballroom in Hartford, Conn., when Mikkey Dee - who went on to bigger and better things with MOTORHEAD and now SCORPIONS - was still playing drums with the band. A lot of the theatrics now are quite similar to what they were then, though they are presented with much greater sophistication. Then, it was low-budget camp, what with the stabbing dolls and styrofoam, Stonehenge-style stage set. Now, as noted earlier, it really is a spectacle. Now I can't wait to see what comes next. Whenever that might be.